Carrying on from the last few weeks posts telling My Story of how my business came to be and then My Top Priorities for running it, this week is the final chapter, summarising some of the most useful things I've learnt. 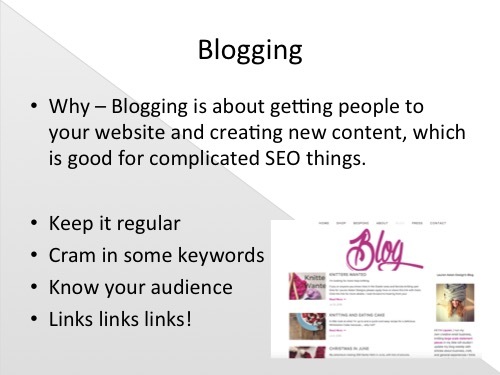 Other than the genuine enjoyment of it and the accessibility of chatting to and sharing things with your customers and audience in a very informal yet direct way - which frankly for me is reason enough - blogging has many advantages and is a very useful marketing tool for your business. Creating new content for your website is vital for SEO so google knows it's not just an empty space with nothing going on. It helps new customers get a handle of who you, the maker are as an individual and gives some personality to your brand. -Keep it regular, again for SEO, as well as giving your customers some stability on when they'll get new information from you. -When relevant, cram in some keywords for your business so google picks them up easily. I would never say 'Welcome to this weeks blog, I've written a post about chocolate around all my giant yarn chunky knitting' that's just spammy and unnecessary. But if for example, I'm talking about a new product I will be sure to get words like 'Merino wool' and 'chunky knit' in. - Links are really important to get to and from your website/blog, not only does it open you up to a whole new audience but again, google loves it. Links will build up naturally as you get out and about and people decide to blog about the things you make but to help it along there's plenty of things you could do. Simply by doing good shows and artisan markets will bring a lot of bloggers to you, who will hopefully want to share what you do. (obviously I wouldn't go just to get links on a website but it's a great if it's the right show for you then it's a great bonus). You can work with someone on a collaboration then you can both discuss your collab in a blog post, linking to one another. You can invite guest bloggers to post an article on your blog, they will then promote it to their audience too giving you both the opportunity to share an entire customer base, likewise if you interview someone of interest to your audience. So many options, as with everything to do with blogs, try to think outside the box, be inventive and have fun! Again, Social media is so fun and a wonderful way to communicate with your audience and it too has many advantages. A big reason to get on social media is that it's free marketing and really importantly - you have total control. Things to remember in general about social media are that you're selling a certain lifestyle that suits your products, I try not to discuss my personal matters too much on my business page as they just aren't relevant to my customer. My customer and audience want to see the things I make and ways to use them. They also want to see some behind the scenes snippets that they wouldn't find on my website, my workspace and me in action knitting for example. My favourite thing about social media is that it is a more casual way to communicate and as long as you don't mistake it for your personal page it compliments your business beautifully by injecting some personality and colour to that professional side. The main social media platforms I use are Facebook & Instagram, I also dip into twitter (mainly for business to business contacts and journo-requests) and I also try to pin a couple of things to Pinterest each week. I began by introducing each platform at a time and figuring out how much I enjoyed it and how much it benefited me etc then I slowly reduced it to a level I could cope with. I now post to Facebook about 5 times a week, Instagram daily and check twitter maybe once a month (but 90% of my Instagram post also get popped on twitter via the IG app,) and I get the notifications so if some one mentions me etc I know and can reply or thank them. I use Facebook above all other social media to chat to people and give some behind the scenes snippets of my business. I don't worry too much about how pretty the pictures are (as opposed to IG) It's more about the content and keeping people informed. - Content it king, there's no point posting rubbish or irrelevant posts just for the sake of it. Before every post ask yourself - Is this relevant for my audience? Will they respond well to it or gain something from it? if the answer is no then you won't get a good reaction to it and consequentially Facebook with squash the reach so not many people will see it anyway. - Because Facebook want you to pay for adverts they don't want you to get it for free so if you write salesy words in a post such as 'sale now on' or 'Shop now' then they'll squash it's reach to try to convince you to pay. Try to be less direct about it. - Another balancing act is regularity, how often to post really is up to you. Again I look at how frequently other people post and if I, as their target market think that's too much, too little or just right. - Final point which really goes for all social media and communications, try not to be too negative. Nobody likes a negative nelly! If you've a bad day, you can share it but try to make it a positive. Is it relevant to your audience if you've had a bad day? Maybe it is and thats fine but try to boost it at the end so people don't go away with a negative feeling from your brand. Last year I wrote a post about using social media for small businesses which has a lot more information if you'd like any more. For me, Instagram is the one. It's a magnificent source of inspirations and such a fun way to communicate with people internationally as well as locally. It's all about the pictures so if you want to gain a serious following you need to be on point with your imagery and style. It's wonderful to use for really visual storytelling, almost like a moodboard of your own business. Instagram is really not about the hard sell, it's far more about showing and selling a lifestyle and introducing followers to beautiful looks and products in a friendly, informal and stylish way. In facts it's so much not about the hard sell that you can't post links in individual posts. Depending on how seriously you take it you might want to curate your feed, see what images look good together and tell a story. You want someone to click on your IG feed and know exactly what you do as a business rather than seeing random pictures of your recent night out followed by a food pic of your breakfast. It's the lifestyle of your business, so customers can see it and understand instantly how it would fit beautifully into their lives. If you'd like to know more specifics on using Instagram for businesses I recently wrote a blog post on just that with far more information. Now for a quick look at sales platforms, there's so many I can't go into too much detail and I'm sure i'm not aware of them all but here I've covered the ones I use and the advantages and disadvantages of those. The platforms I sell on are - My own website, Notonthehighstreet.com, Etsy, certain shows and to a select few Trade stockists. Own Website - It's SO important to have your own website, not only do you not have to pay commission on each sale but it's vital that you have your own corner of the internet to display your products that YOU control. It is 100% you, your choice of wording, imagery, layout, links, blogs etc. You. Even if someone else designs it and a photographer takes your photos etc you still have ownership of what goes on in that space and it's a really vital way to represent your brand. Notonthehighstreet.com - I cannot speak more highly of NOTHS. I adore being part of their community and feel really honoured to be able to sell with them. I always recommend people apply to sell with them if they think their products are right. The thing to remember with NOTHS is that they really know who their customer is and what she wants. It's highly curated so you need everything on there to be approved before you can sell it. I'm a huge fan of this because it really means that the customer is being shown products that will interest her rather than having to wade through loads of other stuff first. There is a joining fee (currently around £200+ Vat I believe) and commission of 25% + VAT (so 30%) on each item sold. It isn't for everyone but if you don't get on, please don't be disheartened, it doesn't mean your products aren't good, it just means that the NOTHS customer isn't your customer. Etsy - I'm new to Etsy but i'm enjoying it so far. It has good stats that are helpful to find your keywords and apply them to your other platforms. It's easy to use, great for international orders as you can set your shipping costs per product and the commission fee is really low (3.5% + a small listing fee). Etsy isn't curated so there is SO much on there, this is both good and bad, it does bring a lot of people to the site but it also means you have to fight harder to be noticed. From courses and reviews I've done so far, I've learnt that the more listings you have the better, as it creates more ways for customers to find you. I've also learnt that your keywords are vital, especially the first phrase of your product title. Becka Griffin does an excellent review if anyone needs help and advice or like me when I started - doesn't know where to begin. Shows - Can be really great, a wonderful way to meet your customers face to face and see who they are first hand as well as get your own face out there and allow people to touch and feel your products (especially for products like mine where they are so tactile everyone always wants to touch them) The important thing is to do the right shows, go visit them first and look around at the other stall holders, the visitors, the area. What time of year is it? Will that work for your products? How much does a stand cost? (+ your expenses if you need to stay in a hotel, what you'll eat etc - I always need to hire a van so thats around £100 a time too) Are people spending? Is it likely that you'll get back that cost and if not is it worth it anyway for the exposure? Don't forget that a lot of people like to see things for ideas then order online later and those sales still count towards it - I have a little text box on my website when someone places an order that asks "How did you find me?" and it's priceless for me to know if what i'm doing on Facebook is paying off or if I met them at a certain show or which magazine they saw me in etc. The long and the short of it is - figure out if it's where your customer is and whether or not it's right for your brand before you commit. Trade - Again trade isn't for everyone, most shops look for a 100% mark up (so 50% off RRP's) and a lot of makers can't afford to knock so much off their prices or don't want to raise RRP's that much to be able to do so. Personally I've worked out a method that suits me and the mark up is different per product. You need to still have some margin but trade is more about the exposure and bulk orders that earning loads of money. Another thing i've done is spent 3 days building a PDF 'Trade Pack' with all the information, prices and imagery, that really represents what my business is about. Now when I get trade enquiries I can attach it to the email and they have everything they need. Final point on trade is to do your research too, make sure that your products will suit their shop and don't be afraid to politely decline if you don't think they will. Everything you do should be for your brand and your customer. Once you know your customer you'll know where he/she shops and what he/she wants, and then you can design products for them and put them in the right places for them to find. Stay organised and plan. (from last weeks posts) My Christmas starts in February for a reason, yours may not take quite so much time but make sure you've get everything planned out for all your important gifting occasions as well as the smaller things like planning your social media and promotions of new products. Apply for everything and anything, say yes and get out your comfort zone, you never know what will happen when you put yourself out there. And my mantra for tough days - If it was easy, everyone would be doing it! There's hard days in every job but as long as this is ultimately what does, or will make you happy, then grab a cup of tea and a biscuit, take a short break then crack on and stick at it, you'll get there in the end! Thanks for visiting you lovely bunch! feel free to add comments below with anything i've missed or any questions.